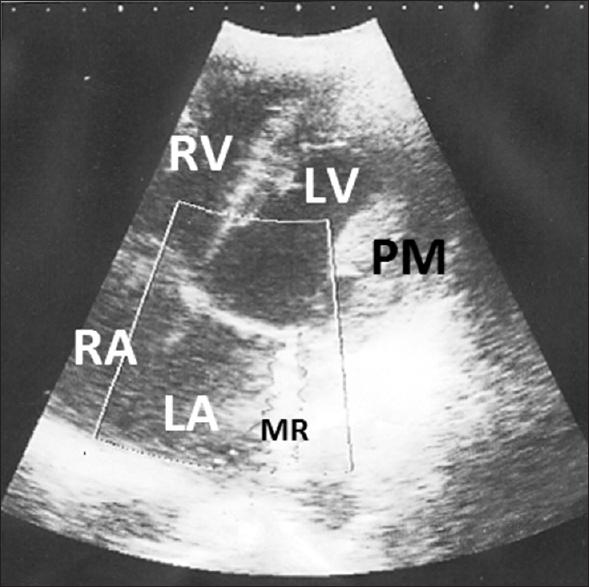 Isolated hypertrophy of the papillary muscles is a rare echocardiographic finding with isolated case reports. Here, we report such a case. A 20-year-old male presented with atypical chest pain. There was no history of breathlessness or syncope. His family history was not relevant. Clinical examination was normal. Electrocardiogram was unremarkable [Figure 1]. Skiagram of the chest was normal. 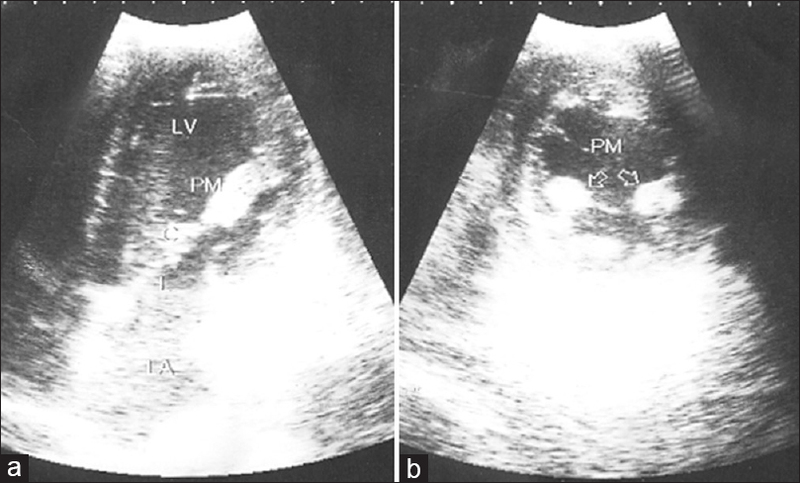 Echocardiographic examination revealed isolated hypertrophy of both papillary muscles of the left ventricle [Figure 2]a and [Figure 2]b. Maximum end diastolic ventricular wall thickness was 10 mm at the interventricular septum in the parasternal short-axis view. Left ventricular systolic and diastolic functions were normal. There was no intraventricular or left ventricular outflow tract gradient. Color Doppler evaluation revealed mild eccentric mitral regurgitation [Figure 3]. Laboratory examination did not reveal any abnormality. The patient responded to analgesics. He refused for any further evaluation including genetic testing. First-degree relatives were asymptomatic and did not agree for screening. Isolated papillary muscle hypertrophy is a rare echocardiographic finding. Exact etiopathogenesis and clinical significance are not known. Some authors have postulated that it could be a variant of hypertrophic cardiomyopathy.,, Increased left precordial voltage and/or nonspecific T-wave inversion has been reported in some cases. Cardiac magnetic resonance is more sensitive in the precise evaluation of the papillary muscles. More studies are needed to better understand this entity. 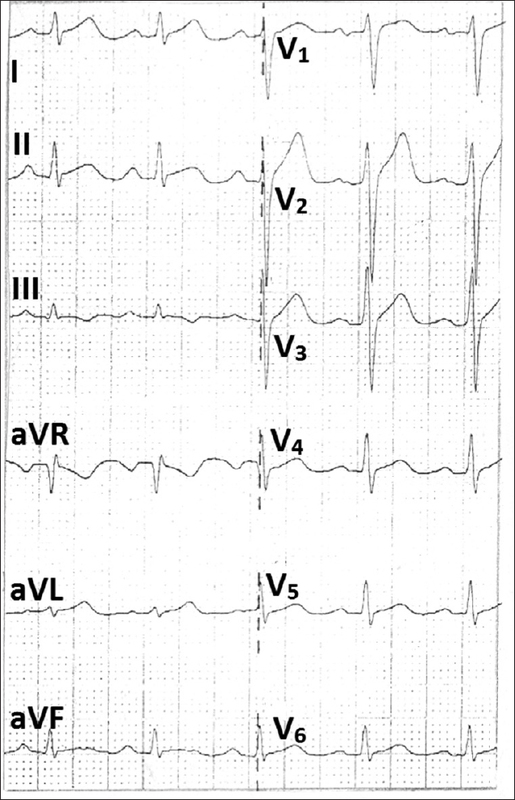 Ker J. Solitary papillary muscle hypertrophy: A new echo-electrocardiographic syndrome? A case report. Angiology 2007;58:502-3. Kobashi A, Suwa M, Ito T, Otake Y, Hirota Y, Kawamura K, et al. Solitary papillary muscle hypertrophy as a possible form of hypertrophic cardiomyopathy. Jpn Circ J 1998;62:811-6. Correia AS, Pinho T, Madureira AJ, Araujo V, Maciel MJ. Isolated papillary muscle hypertrophy: A variant of hypertrophic cardiomyopathy? Do not miss a hypertrophic cardiomyopathy. Eur Heart J Cardiovasc Imaging 2013;14:296. To AC, Lever HM, Desai MY. Hypertrophied papillary muscles as a masquerade of apical hypertrophic cardiomyopathy. J Am Coll Cardiol 2012;59:1197. Ferreira C, Delgado C, Vázquez M, Trinidad C, Vilar M. Isolated papillary muscle hypertrophy: A gap in our knowledge of hypertrophic cardiomyopathy? Rev Port Cardiol 2014;33:379.e1-5.